Embellish your edges with the sixth set in the Corner Adorner series! This month’s edition includes two delicate lace designs, sure to add soft, romantic flair to all of your projects. Pair these images with the included sentiment or any of the greetings already in your collection to give your cards a graceful elegance that is sure to make this set an instant classic. STAMP DETAILS: This set comes on one 3 x 4 acetate sheet. The four-petal lace design measures 1 ⅞” wide by just over 2 ½” tall. The doily style lace design measures 2 ½” wide by 2 ⅕” tall. The “…so happy for you” sentiment measures just under 2 ⅓” wide by ½” tall. The “I’m” sentiment measures just over ½” wide by just over ¼” tall. The “We’re” measures just under ⅞” wide by just under ⅓” tall. 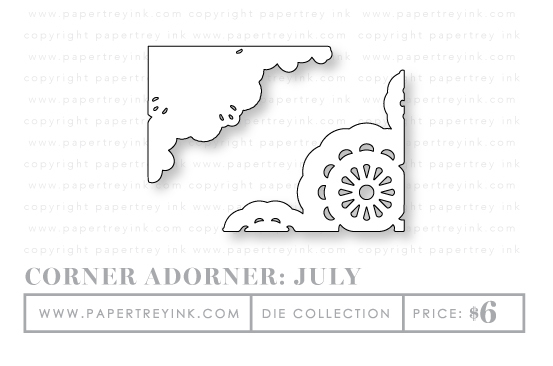 The Corner Adorner: July die collection coordinates with the lace images in the Corner Adorner: July stamp set. DIE DETAILS: Contains a total of 2 dies. The landscape changes by the season, and there are always new things to be found along the fence line! 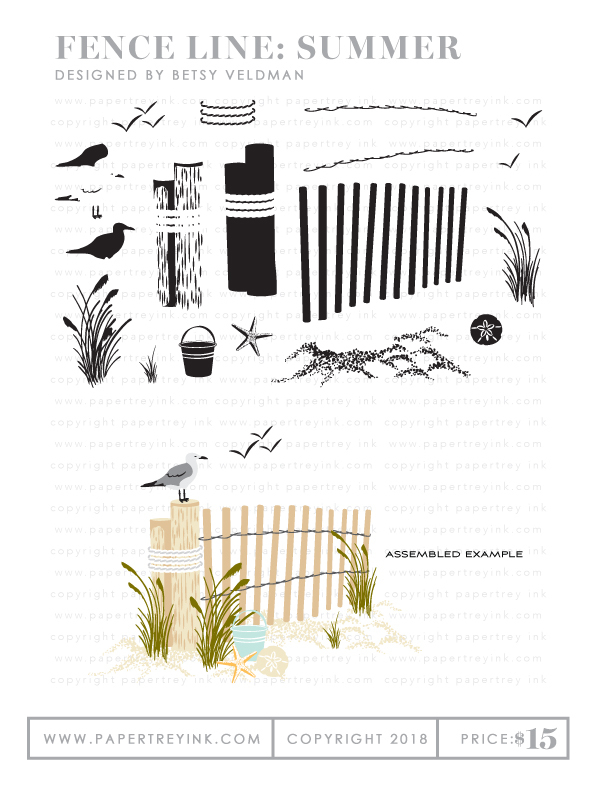 The Fence Line: Summer set features a rustic beach fence, complete with beach grass, sand, and shells. The seagull and sand pail add a touch of whimsy. Have fun building scenes with this set, perfect for birthdays, thinking of you, encouragement projects, and more! STAMP DETAILS: This set comes on a single 4×6 acetate sheet. The fence alone, without the end post measures 2-1/3” wide and 2” high. The rope-wrapped post measures 7/8” wide and 2” high. The larger grass cluster measures 1” wide and 1-1/2” high. The seagull measures 1” wide and 5/8” high. The pail measures 1/2” wide and 3/4” high. The sand measures 2-3/4” wide and 7/8” high. 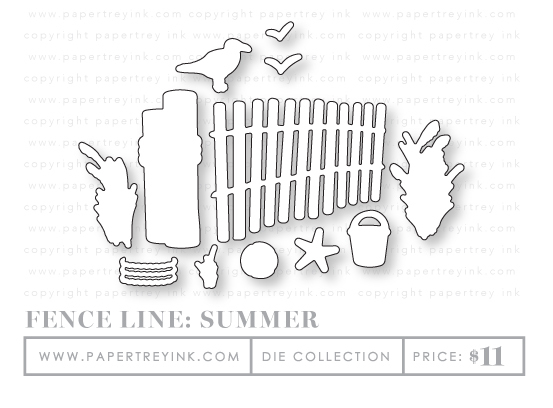 The Fence Line: Summer die collection consists of 12 dies, and coordinates with the Fence Line: Summer stamp set, allowing you to easily layer the grass, shells, and more, over the fence for pretty, dimensional effects. DIE DETAILS: Contains a total of 12 dies. It’s true….you can never have enough thank you sentiments! This set contains a variety of words and phrases that you can mix and match to create a wide variety of customized sentiments for cards, tags, wraps, and more. You’ll never run out of ways to say thank you with all the options this set provides! STAMP DETAILS: This set comes on one 4×6 acetate sheet. “With gratitude” measures 2-1/16” x 9/16”. “Thanks, Friend” measures 1-1/2” x 5/8”. The all caps “THANKS” measures 2-1/8” x 5/16”. “Grateful” measures 2” x 3/4”. “Thank you so much” measures 2-1/2” x 3/8”. “SO MUCH” measures 1-1/2” x 1/4”. “Sending sincere” measures 1-5/8” x 1/4”. The script “Thanks” measures 1-1/2” x 1/2”. “From the bottom of my heart” measures 1-3/4” x 5/16”. “For the gift” measures 1-3/16” x 1/8”. “THANK YOU” measures 1-7/8” x 7/8”. “Grateful for you…” measures 2-1/8” x 1”. “Truly Grateful” measures 2-1/4” x 7/8”. “For your thoughtfulness” measures 2-5/8” x 1/8”.